Tim Hornbaker tells the story of the collapse of the pro wrestling territorial system within the United States. I long believed that Vince McMahon was mainly successful in establishing a nation-wide wrestling promotion because he was a visionary; that he was the first of the American wrestling promoters to give it a go when it came to territorial expansion. Many before him had tested the territorial limits by attempting to expand into nearby states, but never with the gusto that McMahon possessed. However In Death of the Territories, Hornbaker makes a case that while Vince was certainly successful in part due to his ruthless promotional tactics, his rise to power was definitely aided in part due to the ineptitude of his competition. In fact, most promoters just believed that Vince was doing it all wrong – that they could sit back and wait for him to fail. When they finally realized that McMahon was paving the road to the future rather than falling off the trail, it was too late. Vince was already too far ahead to be caught, the most anyone could do was just live in his shadow. Hornbaker touches on changing trends in society, wrestling latching onto the rock and roll youth movement and the accessibility of cable television- a key weapon in the wrestling war. Cable allowed promoters to provide their vision of wrestling to fans beyond their territory laying the groundwork for live events in states thousands of miles away. It wasn’t a cake walk for Vince and his military of muscle however. Hornbaker tells of Vince’s financial issues early on where he nearly didn’t succeed in his grand vision. I found these stories the most interesting given that Vince is now the purveyor of wrestling history, so these facts rarely escape into the public eye. 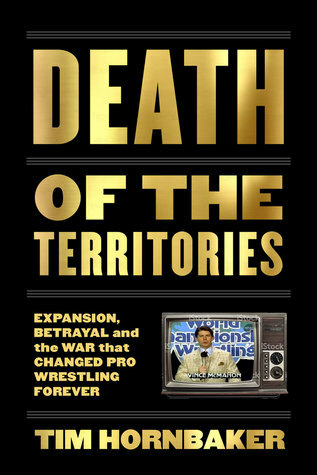 With nearly forty pages of footnotes, Tim Hornbaker’s Death of the Territories is a tightly researched, engaging read that tells of the turbulent years surrounding Vince’s conquest of the wrestling world and the struggles of those that tried to keep up.